A critical part of leadership is recognizing that your fruit grows on other people’s trees. Fruitful leadership focuses on the responsibility of healthy leadership reproduction as the primary way to cultivate ministry expansion. You are not successful as a leader until you can introduce your successor. Many churches are waking up to the fact that every pastor is an interim pastor. But the truth remains that this maxim plays out at every level of your church’s leadership pipeline. Every volunteer, leader, ministry director, and senior leadership role in the local church is an interim role, and every leader is not successful until they have developed at least one successor. So what does succession look like within your church’s leadership pipeline? Succession is about leadership reproduction. In far too many cases, we have allowed our thinking to shift into leadership placement over leadership development. Our number one job as leaders is to reproduce ourselves, not replace ourselves. When we focus on replacement, we not only dismiss the responsibility we are given as church leaders, we settle for warm bodies instead of weekly volunteers. In recent years, we have gotten better at talking about succession, but often succession only refers to senior leadership within a leadership pipeline and is rarely more than a dream with few details and no deadlines. What some would call succession planning is really just replacement planning. Replacement planning looks more like risk management and is often a folder to pull out if a key leader suffers a medical emergency or experiences a moral failure that immediately removes the individual from leadership. True succession planning is quite different. Succession planning focuses on leadership reproduction over leadership replacement and leads with a proactive posture, not a reactive one. Succession planning also provides continuity of leadership by cultivating leaders within the church or organization’s leadership pipeline. Succession is not only concerned with the top levels of leadership or the key leaders of the organization but is a long-term investment strategy in the organization’s most valuable resource: its people. Far too often in our world and even in our churches, leadership is seen more as a position of power than a position of responsibility. Development within a leadership pipeline requires an investment of intentional time and effort. Succession happens when your people are engaged by the mission, equipped to do it, and accept the responsibility to carry it out. Leadership development must occur up close, both shoulder-to-shoulder and eye-to-eye. Consider Moses’ investment in Joshua. Scripture often notes that Joshua was with Moses during pivotal moments in the Israelites’ journey: receiving the Ten Commandments (Ex. 24:13), smashing the stone tablets (Ex. 32:19), and observing Moses’ fellowship with God (Ex. 33:11). Moses’ intentional development of Joshua prepared him to lead the Israelites into the Promised Land after Moses’ death. As a pastor or ministry leader develops and equips their successor, a transfer of responsibility must occur. These four phases allow the pastor to gradually relinquish authority and fully prepare and equip a new leader to step into the role. 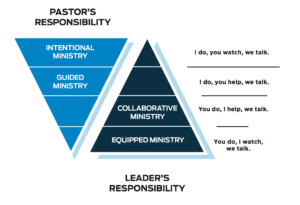 In the Intentional Ministry phase, the leader maintains responsibility while the successor observes the role. Next, the leader allows the successor to assist with role responsibilities in the Guided Ministry phase. The Collaborative Ministry phase is just as described, the leader and successor work together to fulfill the role responsibilities. And finally, in the Equipped Ministry phase, the successor has assumed the role responsibility of the leader. Throughout the process, ongoing communication allows for feedback and growth. These four phases don’t occur overnight. Sometimes the relinquishing may occur over a matter of months. Other roles may take years to fully hand off, like Moses and Joshua. But what doesn’t change is the intentional development of a successor. The defining legacy of any leader is the quality of those you develop and your ability to transition out of your role—at any time and for any reason, with little drama or disruption. Whether sacred or secular, organizational leadership matters, and continuity of leadership matters all the more. This may seem counterintuitive to the popularized view of leadership. However, we are not called to such a limited view. We are called to equip the saints for the work of the ministry. If we do so, we will see unity in the body, maturity measured in the fullness of Christ, and a multiplication of ministry and ministers that hasn’t been seen since the early church. Leaders build an army, not just an audience. We must shift the conversation from talking about our church’s seating capacity to its sending capacity. Want to learn more about succession? Download our free Pipeline: Succession at Every Level e-booklet. Join us this October for our conference Pipeline: Succession at Every Level. Adapted from Douglas Fisher and Nancy Frey, Better Learning Through Structured Teaching (Alexandria, Va: Ascd, 2014), 3.